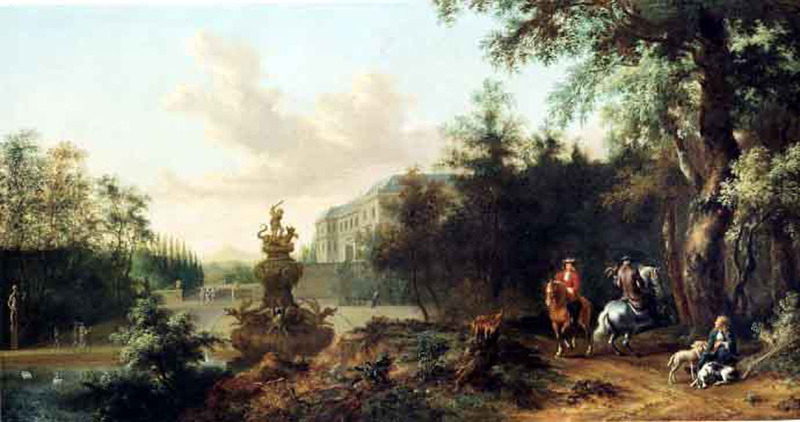 A wooded landscape outside a country house, with sportsmen hawking. Oil painting on canvas 38 x 70 inches / 96.5 x 178.0 cm., and contained within a good 17th century carved and gilt frame of oak-leaf and acorn form. Overall size 47 x 79 inches / 119.4 x 200.6 cm., including frame. Dirk Dalens II was the grandson of the like-named Dirk Dalens I (1600-1676) and the son of the Willem Dirksz. Dalens, both of whom were landscape painters in Haarlem and Dordrecht and, later, in Amsterdam. Dirk II was born in that city in 1659. He was the pupil of both his father and grandfather, but his style was altogether more “modern”, taking on the elegant Italianate air which had been introduced into Dutch painting by such artists as Jan Both and Nicholas Berchem. His work is rare, and few signed examples are known. His work is elegant and suffused with warm southern light and is reminiscent of the work of Frederick and Isaak de Moucheron. His son, Dirk Dalens III, was born in 1688 after the death of his father, and continued the family’s 150-year tradition of landscape painting into the fourth generation. He died in 1753, sixty-five years after the death of his father. The present painting is wholly typical of his refined output, and should be considered as at least the equal of any of his small recorded oeuvre.